So better than most parts of the UK, then? LOL! Yes, it is true. In the future you'll be able to check Twitter, update Facebook, stream some Netflix, and leave an abusive comment under a YouTube video... all while standing on the surface of the moon. That is because, following a launch next year, Vodafone will install a 4G data network on Earth's cosmic companion. 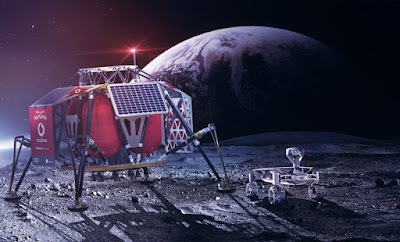 Not just a PR stunt, the network will primarily be used by a pair of rovers that are being launched to the moon in order to study the Apollo 17 landing site, last visited in 1972. The 4G network will be used to transfer info from the small rovers back to their base station, for transmission back to earth. The project will also be the first private moon landing, organised by Germany's PTScientists (working with Audi) and launched by Elon Musk's SpaceX. Once established, and after the mission is completed, there will then be a mobile network available on the moon. That's a pretty big deal, and something we could see a lot more of in the future. After all, the more steps out into space we take, the more we'll need these permanent systems in place in order to make communications easier. “In order for humanity to leave the cradle of Earth, we need to develop infrastructures beyond our home planet”, said Mr Robert Böhme of Vodafone Germany. fair point.